Researchers have found the faintest galaxy known to man, billions of light-years away. When NASA scientists peer into deep space using powerful telescopes, they’re actually looking back in time. Light from the very beginning of the universe can still be detected, and by focusing in on this energy, researchers are able to determine much about how the universe formed and what has occurred since then. According to a report from Immortal News, researchers using the Hubble and Spitzer space telescopes have located an object that was formed 13.8 billion years ago, roughly 400 million years after the big bang. On the timescale of the universe, this is a short window indeed. The researchers named the object Tayna, and in addition to being the oldest object ever discovered, it is also the faintest. According to the Space Association, the object represents a class of newly forming galaxies that were so small researchers hadn’t noticed them until now. Tayna is roughly the size of the Large Magellanic Cloud, a galaxy that orbits around our own, the Milky Way. It is churning out stars at ten times the rate of the Large Magellanic Cloud, and scientists think that it may even become a full-sized galaxy. 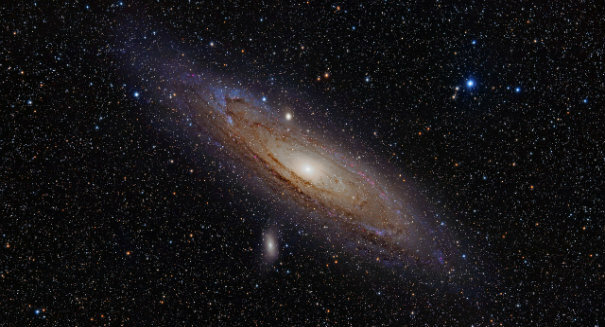 According to Leopoldo Infante, an astronomer from the Pontifical Catholic University of Chile, “Thanks to this detection, the team has been able to study, for the first time, the properties of extremely faint objects formed not long after the big bang.” The galaxy was located among 21 other new galaxies. Hubble researchers spotted the galaxy when they encountered a natural magnifying glass in deep space. This phenomenon, called gravitational lensing, is caused by massive galaxies bending light as it travels past them towards instruments here on earth. It acts as a zoom lens on a camera, making far-away objects appear up to 20 times brighter and larger than normal. Scientists have big plans for Tayna; they hope to research the galaxy using the James Webb Space Telescope, planned for launch in 2018. Their findings may lead to new insights into how the universe came to be. A press release from NASA describing the details of the discovery can be found here.